Okra – it’s one of those southern foods that you love, hate or have to ask someone, “What is okra?” There is no middle ground! My husband despises it in any shape or form. I happen to be in love with okra. I’ve never liked harvesting it by cutting it from the stalk. Boy, does it itch. 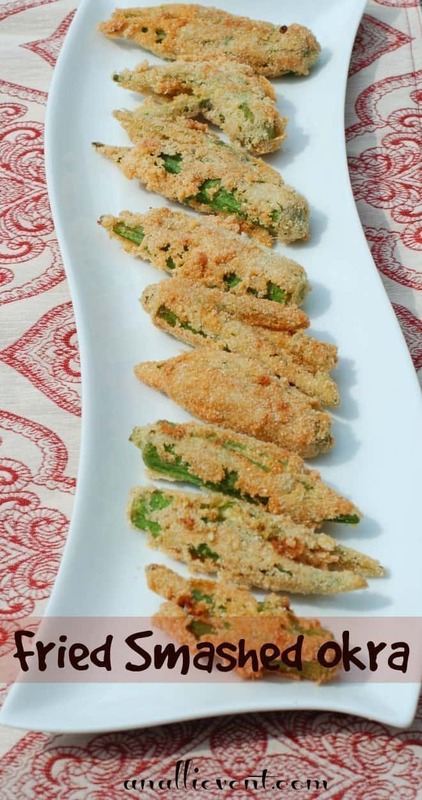 But I adore okra sliced, dipped in seasoned cornmeal mix and fried crispy brown. I also happen to like it boiled in a pot of freshly picked peas. I know it’s slimy, but hey, I like it. Period. But I’ve never had smashed fried okra! It’s whole okra pods, smashed with a meat mallet, dipped in buttermilk, seasoned cornmeal and fried. So I had to try it. I haven’t seen my meat mallet since my kids were small and I caught them outside making mud pies with said meat mallet. So I improvised by using my small hammer wrapped up in a freezer bag. Don’t judge me. It worked beautifully! When I added the Kosher salt and pepper, I also sprinkled in a little cayenne pepper and garlic powder to give it a little extra kick. I’m a little extra kick kind of person! Was it a hit or a miss? I absolutely loved it! I’ll never slice okra again! Well, maybe every once in a while. What a time saver that I had never thought of! It’s crunchy, spicy, and a little soft in the middle. It’s the perfect appetizer or side dish and I’ll definitely make it again. And again. And again. You can find the recipe here or on page 101 of the June 2014 Southern Living magazine! Do you eat okra? If so, how do you like your’s cooked? Ashey @ 3 Little Greenwoods recently posted…Blogging Make your Head Hurt? Buy this e-book! I Pinned this to my Good Eats board for others to see. Fried okra is one of those foods (like fried oysters) that has to be eaten as soon as it’s cooked. I don’t like it cold at all. My husband would absolutely love this. Let me know if you make it and if your husband likes it. I just can’t believe I’ve never thought about doing it like this – so much easier. This looks so good! We love fried okra in our house! Yes! An okra loving family! I live in Georgia, so I should say that I eat Okra all of the time, but that’s not the truth. This looks simple enough! I love the taste of it, so I’m going to give it a try! 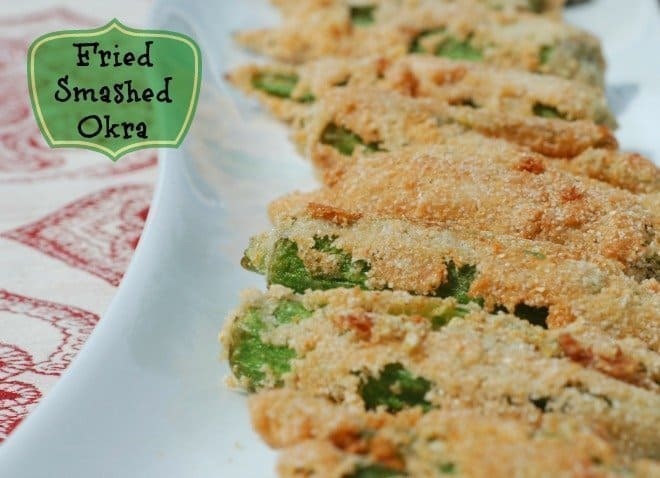 This would be a miss for me since I don’t like okra and fried foods but Mr. M would love this so it would be a hit for him! I love fried okra! Even my husband who doesn’t like green veggies will eat fried okra dipped in horsey sauce! I’m going to have to try this recipe. Oh, yeah! Dipping sauce makes everything better! You and my husband would get along just fine. He hates it, too! I’ve never actually tried Okra, however I have had several people recommend it to me and I’ve considered growing it (good to know that it’s itchy to pick and I have to get it while it’s small). This looks like something I should try. Alli this looks AWESOME! Are you available for parties? 🙂 I love okra! Or fried zucchini? Goodness! Anything friend is a great idea 🙂 Thank you for sharing! Neatly-Packaged recently posted…Wicked Pinterest Finds: Honeymoon in Paris! I’ll be right over! I try not to eat fried foods very often, but I mean, really? A southerner has to eat something fried once or twice a year. Now this looks like a great idea! I can’t eat anything fried like this, but my hubby would LOVE it! I’ll have to give it a try for him! I am one of those who has to ask “What is okra?”. Even though I know what it is, but have never tried one. It is a warm weather crop (a thing for the south), so I figured that I better do not like okra otherwise I would have to grow it in my already overcrowded greenhouse. But you make me curious to try, looks so yummy! It is yummy, Anna and I’ve been eating it as long as I can remember. It can be bought frozen, but fresh it always better! These looks AMAZING! I love ocra fried – but I am with your husband I could do without the seeds! I love the idea of adding garlic powder and spicing it up a bit – these do indeed look like the perfect app! Gorgeous gorrrrgeous pics! The plate is so cool. The okra was very tasty and the smashing was fun, too! I love okra– I actually like mine with stewed tomatoes and served over rice. This looks yummy! Oh, yeah, I love it that way, too and in vegetable soup. I love fried okra! I’ve never had it smashed, but can’t wait to try it. Thanks for the recipe!! It was kinda fun smashing that okra with the hammer. I need to make this for my Nonnie! She loves okra! Still have to make this. I have never had okra, but I’m sure I would love it if it’s fried and has ranch dressing! 😉 It looks like an appetizer from a restaurant, so yes, you are a chef!